Rent Jekyll Island Club Hotel | Corporate Events | Wedding Locations, Event Spaces and Party Venues. The legacy of the original Jekyll Island Club is one of history and hospitality. Founded in 1886, the Club was once the private winter retreat of America’s wealthiest families with such members as Morgan, Rockefeller, Pulitzer and Vanderbilt. The Jekyll Island Club Hotel has been a cherished setting for generations of happy couples. here, a wondrous sense of history walks hand in hand with the unforgettable celebrations. Intimate and grand, casual or formal. Every event is presented by a team devoted to delighting the wedding party and their guests with the thoughtful planning and flwless exectution amid the resort's unrivaled multitude of romantic, inspiring venues for ceremonies and receptions-from lush gardens to historic mansions to riverfront lawns to beach settings and ballrooms. Let the Jekyll Island Club Hotel make your wedding day magical, marvelous and memorable. Over a century ago, the nation’s legendary corporate tycoons, elite industrialists and visionary business leaders gathered here at the Jekyll Island Club. Today, the Hotel remains a favored choice for productive and memorable business conferences that delight both meeting planners and meeting attendees. Whether it’s an executive company retreat for a dozen or a large-scale conference for hundreds, the Hotel’s pre-planning and attention to detail are unrivaled and the execution of services is personalized and flawless. Our resorts for large groups feature everything from elegantly appointed boardrooms to our Ballroom and the expansive Morgan Center. 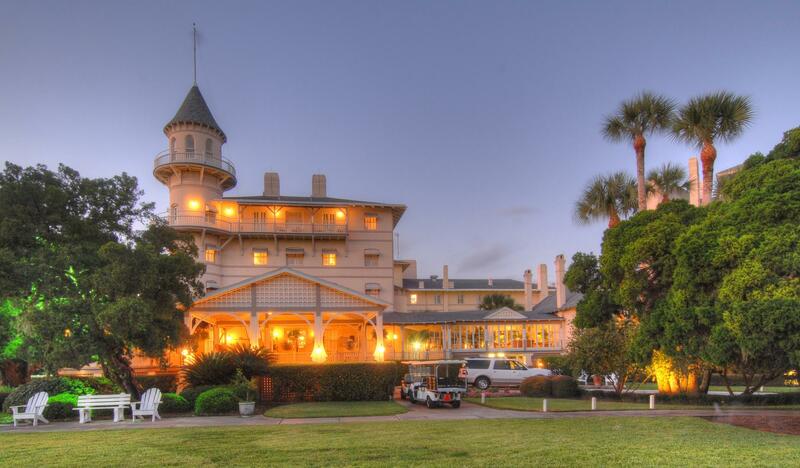 The Jekyll Island Club Hotel has been a cherished setting for generations of happy couples. Jekyll Island weddings are where a wondrous sense of history walks hand in hand with unforgettable celebrations. Intimate or grand, casual or formal, every event is presented by a team devoted to delighting the wedding party and their guests with thoughtful planning and brilliant execution amid the Hotel’s unrivaled multitude of romantic, inspiring venues for celebrations and ceremonies.